Sorry I’ve been less prolific in my blogging lately, but I have a good excuse 😉 I’ve been stepping out a bit and writing for some other publications. In the next issue, I’ll be including some new golf course reviews from my trip to Arizona the month and an inside look at the Big Break PEI from some of the contestants. So I hope you’ll check that out when it’s published in early June. 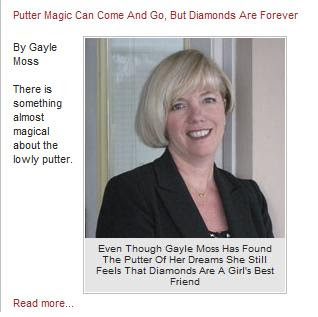 I am also very happy to have a regular column now in Inside Golf Magazine. So far, I’ve published 4 articles. A new one on Derek Gillespie from Big Break PEI will be out later this week. 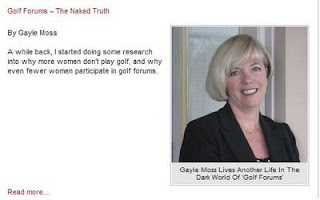 I plan to write a new column every week (unless great golf weather interferes with my good intentions), so please drop by and check them out. You’ll find that my column is not unlike this blog – I write how I feel, which can sometimes be a bit controversial ;), But hey…there’s nothing like a good debate over a hot topic, right? 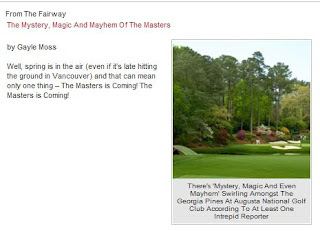 Check out my opinion pieces on The Masters, Duramed FUTURES Tour, Golf forums and some golfers’ bizarre relationships with their flatsticks. I’ll be sure to let you know when my next article comes out this week on Big Break PEI, but if you wish, you can just sign up for Inside Golf’s newsletter.. There’s a ton of other great stuff in there!